David Cushley is mobbed by his Ballymena United team-mates after his remarkable long-range goal in today's Danske Bank Premiership match against Linfield at the Showgrounds. Picture: Press Eye. David Cushley’s goal of the season contender wasn’t enough to prevent Linfield from recording a 3-1 victory at the Showgrounds on Saturday. 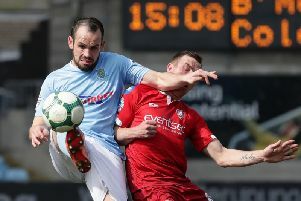 The winger’s spectacular long-range strike had given Ballymena United a first half lead but the Blues stormed back to claim the three points with second half goals from Sean Ward, Andy Waterworth and Guy Bates to keep their flagging Danske Bank Premiership title hopes intact. It was the visitors who made the brighter start with Jamie Mulgrew robbing Tony Kane of possession in midfield in the second minute and feeding Paul Smyth but he blazed his effort over. The youngster was again involved a couple of minutes later when he got away from Michael Ruddy but as he bore down on goal, his effort was blocked by the feet of United keeper Alan Blayney. The former Northern Ireland international stopper was again called into action on eight minutes, diving to his left to tip Niall Quinn’s curly free kick around the post, as the Blues dominated the early exchanges. After that early flurry, Ballymena eventually got a foothold in the game, which went into a disappointing lull for a spell. Linfield had another chance on 27 minutes when centre-back Mark Haughey’s powerful goalbound downward header from a Quinn corner kept out by the feet of a team-mate. Instead it was Ballymena who went ahead with their first meaningful effort on 34 minutes - and it was an astonishing strike from Cushley. Collecting a clearance from Linfield keeper Ross Glendinning on the left hand touchline, five yards inside the Linfield half, the winger spotted the keeper out of position and fired an audacious effort which sailed over the keeper’s head and bounced once before bouncing high into the roof of the net. Linfield’s response was almost immediate as Blayney was caught out of position on the edge of the area after a collision between a number of players but Paul Smyth’s attempt to emulate Cushley’s long-range finish dropped over the crossbar. Right on half-time, Paddy McNally produced a marvellous last-ditch tackle to preserve United’s advantage when he dived to block Jamie Mulgrew’s effort just as the Linfield midfielder was about to pull the trigger. Linfield had a chance to level matters five minutes into the second period when Andy Waterworth’s near post flicked header from Paul Smyth’s corner landed on top of the net. A clever chipped effort from Cushley met with a similar fate before Linfield drew level on the hour mark. Sean Ward ran untracked from midfield to burst clear onto a through ball and he lobbed the advancing Blayney with a neat finish. And the visitors almost went in front on 67 minutes when Jimmy Callacher’s diving header from a Quinn corner kick was met with a fabulous reflex save by Blayney. As the Blues began to turn the screw again, Niall Quinn’s first time effort from a Smyth cut-back clipped the top of the crossbar on its way over. But the visitors did eventually grab the lead on 75 minutes and, not for the first time this season, it was a goal in which Ballymena contributed to their own downfall. Keeper Blayney rolled the ball out from the back and United carelessly gave away possession inside their own half and Linfield quickly countered, switching the ball to the right flank where substitute Jonny Frazer, with his first touch of the ball, cut the ball back for Andy Waterworth to sweep a shot past Blayney. Ballymena tried desperately to salvage something from the game but a strong penalty appeal, when Allan Jenkins appeared to be brought down on the edge of the penalty area, was all they could muster, and instead Guy Bates added a third for Linfield deep in stoppage time when he blasted past Blayney to seal the points. Ballymena United: Blayney, Ervin, Taylor, McNally, Ruddy (sub Ferguson 21), T Kane, E Kane, Thompson, Cushley (sub Hanley 63), Jenkins, Shevlin. Subs (not used): Henderson, McVey, Taggart. Linfield: Ross Glendinning, Haughey, Callacher, Stafford, Clarke, Quinn (sub Burns 81), Millar (sub Frazer 74), Ward, Mulgrew, Smyth, Waterworth (sub Bates 87). Subs (not used): Kee, Reece Glendinning.